Have php with echoing html tags. 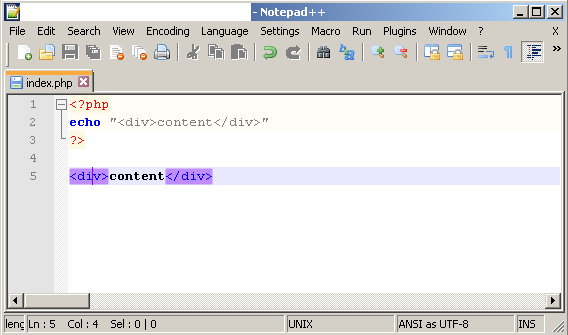 notepad++ 6.4.5 is highlighting ok the tags inside php and outisde php. 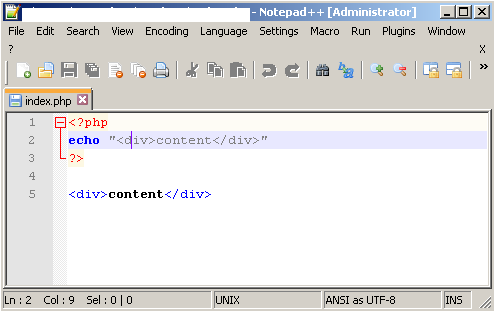 notepad++ 6.5 is highlighting ok the tags only outisde php and NO HIGHLIGHT inside php code. How to enable highlighting of tags inside php code? 3) Now html tags are highlighted in php code. If you will close and open once again the php file, you will have to execute 1-3 again. <Language name="html" ext="html htm shtml shtm xhtml hta"
<Language name="html" ext="html htm shtml shtm xhtml hta php"
<Language name="php" ext="php php3 phtml"
<Language name="php" ext="php1 php3 phtml"
That will disable php files to be parsed as php language. If not doing step 2 => step 1 has no effect. You should be creating your PHP documents as templates of HTML documents, as seen below. Notepad++ is just supporting good coding practices by treating your echo strings as PHP strings and not highlighting them. If you want to break into HTML, then just put a ?> to end the PHP syntax highlighting and it will highlight it as HTML. Then use <?php to start PHP code again, as necessary. You don't need echo to output HTML, just end the <?php ... ?> block and type your HTML like you normally would. Not the answer you're looking for? Browse other questions tagged php notepad++ or ask your own question. 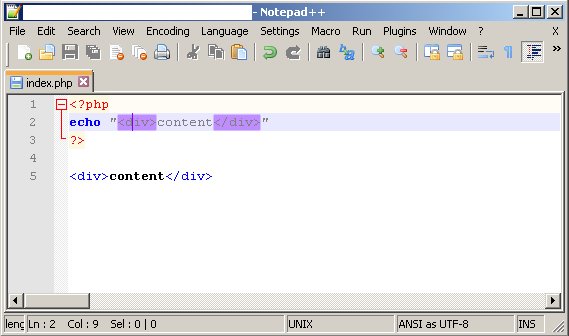 How to enhance Notepad++ to support Laravel blade syntax highlighting in a PHP file?